I used to think I was going to be a Harry Potter when I grew up. I was eleven. I was a skinny guy with glasses. It wouldn’t be long before they would announce that the Harry Potter series would be turned into a movie series. As someone who was eager to fit in with the popular kids and maybe get some female attention for a change, I made the decision: I was going to be cast as Harry Potter. Many of us go through phases as we grow older. Our passions, goals, and hobbies change. Which makes those one or two (or five) things that we continuously love even more special. I have always loved baseball. My passion for baseball never left. And it was because of my passion for baseball that I found myself hanging out with the techies within the theatre department during my sophomore year. Previously I had always been hanging out with the actors. Since learning about how much they loved baseball, I realized that they shared the same passion for the game as I did. We hung out, watched games, drank beer, and caught Red Sox games together. I had found my crowd. 2008 Playoffs. The Red Sox were down. Unfortunately those rally caps didn’t work. Today, I live in Chicago. There’s no shortage of Cub fan stories that you can find. Some of which will probably move you to tears. Which is why I believe that baseball is truly a special game. And is much more than just a game, regardless of your team affiliation. I encourage everyone living in Chicago and surrounding areas to take a closer look at those around you during the month of April. Are your friends smiling more? Are your coworkers approaching their (non baseball) work with an extra zing? I wouldn’t be surprised. It’s baseball season. It’s a special time of year. Finding those things we’re passionate about makes life a whole lot more fun. Don’t downplay those passions, friends. You’re robbing others of your joy. Don’t get me wrong – I’m happy with the path that I’m on right now. 2104 has been a good year. That being said, this week I noticed an unpleasant reoccurring theme: I continue to put myself in unpleasant situations. I work a part time job I don’t like. I quit. I experience brief joy that I’ve left the job. It’s soon replaced by the realization that I don’t like whichever new gig(s) I’ve picked up. The cycle repeats. 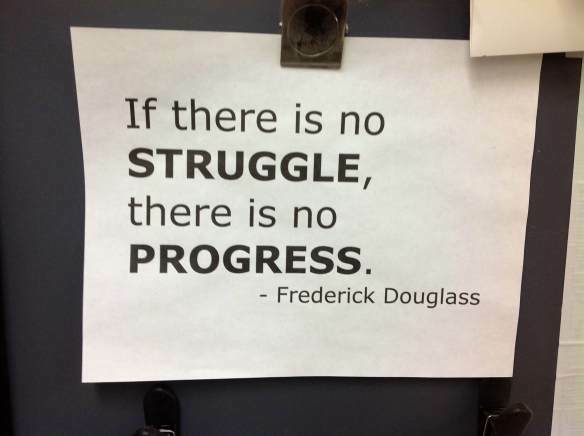 Are you really making progress? Is it worth it to keep going down this path? Should you just redefine your game plan and try a different route? Tony…your goals are enormous. There’s a reason this is taking so long. You’re thinking big. While we’re pursuing a crazy, awesome life, we encounter a lot of negativity. There are obstacles and resistance popping up left and right. If they weren’t there, our goals wouldn’t be crazy and awesome. Take mine, for example: I want a full time income from acting, fitness, and writing. That’s it. (I’ll make an exception for something better that may come along.) Oh, and I want them to give me a somewhat flexible schedule so I can have a social life too. Personally, I hate the word perfect because nothing is ever perfect. There’s always one more thing that could make our situation, our jobs, our income, whatever….a little better. But I’m going to use the word in this case: I want a perfect life. I want you to have a perfect life too. Is it actually going to be perfect? Not actually. That would be silly. But in my crazy, awesome, Tony world, it’s pretty damn close. Go after that crazy, awesome life. Just keep being patient. Your turn: My reoccurring theme while chasing after my crazy, awesome life is that I continue to get frustrated while working new part time jobs. What theme keeps coming up for you?